Quentin Alexander Nisson, 98, passed away peacefully on Dec. 24, 2016. He was born on Aug. 10, 1918, to Clara Reece Alexander Nisson and Edward Sandberg Nisson. He was the fourth child in a family of six. 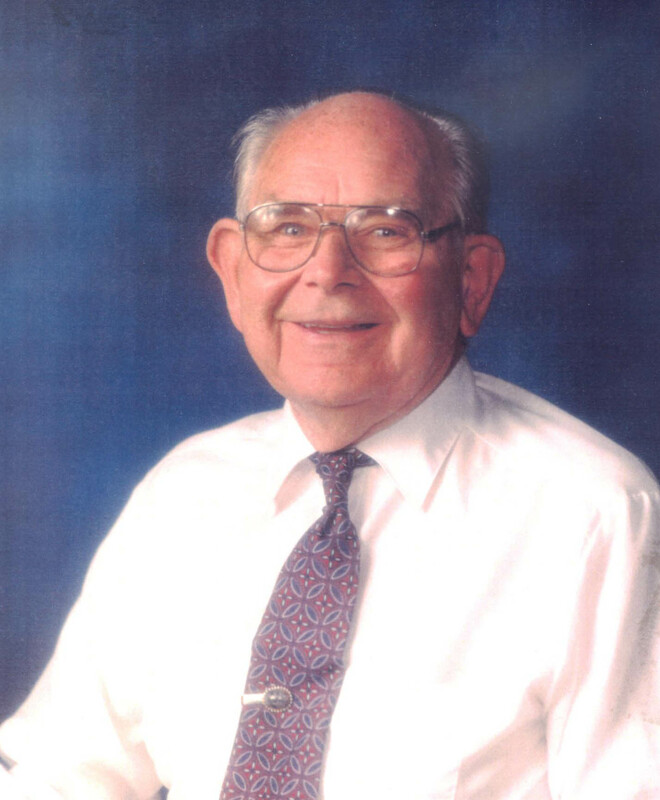 The schools he attended and graduated from were Washington Elementary, Dixie High School, Dixie College and BYU where he received a Bachelor of Science degree in 1941 with a major in history. In November of that same year, he was drafted into the U.S. Army. He spent four years in the anti-aircraft division with over two years of that time spent overseas in England, Belgium, France and Germany. After returning home from his military service, he married Gwendolyn Betty Turner on Dec. 26, 1945. The temple was closed at that time so they were married in the old rock church in Washington and in March of 1946 were sealed in the temple. To their union came five children. Quentin and Gwen purchased the Washington Mercantile in February 1946. He enlarged and remodeled the building three times. He helped two of his sons and a son-in-law in building the new Nisson’s Foodtown which opened in 1985. Quentin and Gwen changed the old Mercantile into a V & S variety store where you could find almost anything. Besides managing his business, Quentin devoted much of his time to public and church services. He chaired the Washington City Centennial celebration in 1957 and later as bishop headed up the fundraising committee for remodeling the old and building the new Main Street chapel. This was a humbling time for Dad as he watched the ward members unite together and happily give of their time, labors and money towards this project. Quentin was mayor of Washington City for 14 years, 1950-1964. During this time the city park was established, a street lighting system was put in, the water systems upgraded, and city streets and the cemetery were improved. Quentin has always loved the piano. He took some lessons when he was younger but always went back to playing by ear as it seemed to come naturally to him. His talent has become legendary and he has played for countless events including weekly senior citizen dances, weddings, funerals, anniversaries, church and other programs. He has enjoyed playing in bands with many talented musicians throughout the years. In 1950 he took charge of keeping the early morning serenade tradition going for the 4th and 24th of July celebrations in Washington. In 1956 he was invited as Mayor to visit the Nevada Testing Site to witness and film the explosion of an atomic bomb. As a result of this, portions of this film have been used by ABC and other news organizations for documentaries about downwinders. Quentin was a member of the Dixie Medical Center Planning Board, the St. George Rotary Club, Zions Bank Board of Directors and charter member of the Washington Lion’s Club. He received the gold Medallion of Service award at SUU in 1992. He also received Senior Businessman’s Award of the year in 1985 by the St. George Chamber of Commerce and was honored to be the Washington County Fair’s Grand Marshal in 1995. As a life-long member of The Church of Jesus Christ of Latter-day Saints, Dad had a deep faith in our Heavenly Father and his son Jesus Christ and he served in many callings including bishop and high councilman. Dad had a keen and curious mind and was interested in every theory pertaining to man and the universe. He especially enjoyed any kind of history, geology, weather reports and records, watching the news, reading the newspaper daily and talking about politics. He was totally devoted to the Dixie area, its history, and culture and to Washington City. He was especially proud of his pioneer heritage and the struggles and tragedies of the early Dixie pioneers who settled the area. Dad valued everyone’s opinions and was very tolerant and understanding of people. We think he probably lived by Will Rogers’ famous quote, “I never met a man I didn’t like.” Working in the store gave Dad and each family member that worked with him the chance to learn from and enjoy friendships with so many wonderful employees and customers over the years, which in turn have blessed and enriched our lives immensely and we wish to say “Thank You” to you all. The family would like to thank Applegate Home Health and Hospice for the loving care and kindness extended to Dad and our family this past year. Quentin is survived by his children: Robert (Joanne) Nisson, Garth (Odette) Nisson, June (Arshal) Bowler, Mareli (Terrill) Clove and Kelvin (Betty) Nisson; 25 grandchildren, 28 great-grandchildren, two great-great-grandchildren; and sister, Roma Morris. He was preceded in death by his wife, Gwen; grandson, Kyle; and siblings: Gwennie, Clark, Darrell and Ralph. Visitations will be held Friday, Dec. 30, from 5-7 p.m. at Metcalf Mortuary, 288 W. St. George Blvd, St. George, Utah, Saturday, and prior to services, from 9:30-10:30 a.m. at the church. Funeral services will be held Saturday, Dec. 31, at 11 a.m. at the Washington LDS 4th Ward Main Street Chapel, 82 N. Main, Washington City, Utah. Interment will be at the Washington City Cemetery Utah. Arrangements entrusted to the care of Metcalf Mortuary, 435-673-4221. For condolences, full obituary, and funeral listings please visit our website www.metcalfmortuary.com. Obituaries are received from the public and are not the product of St. George News, its editors, staff or contributors. The matters stated and opinions included are the responsibility of the person submitting them. Obituaries may be submitted for consideration to St. George News via email to obits@stgnews.com.